This course looks at the work of Leonardo da Vinci and Michelangelo Buonarotti, the two protagonists of the High Renaissance whose fame has assumed mythical proportion over the centuries. The work of these artists will be analyzed against the cultural and intellectual background of sixteenth-century Italy. Issues discussed in the course include the philosophical and scientific inquiries that defined the humanist discourse: from Petrarch to Boccaccio, the Platonic Academy of Marsilio Ficino and Pico della Mirandola, notions of individualism and morality in Machiavelli and Erasmus. The course will then briefly address the new challenges of knowledge – discovery of new worlds and investigation of nature, which led to a re-definition of the medieval mindset (Columbus and Magellan, Copernicus and Galileo). The class will also examine the social context through a discussion of commerce and trade and the rise of the military and mercantile elites which provided the financial impetus to patronage of the arts and humanities (from the Medici of Florence to the Sforza of Milan). The focus of the course will be on the impact of these developments on the arts and the re-definition of the Renaissance visual code. 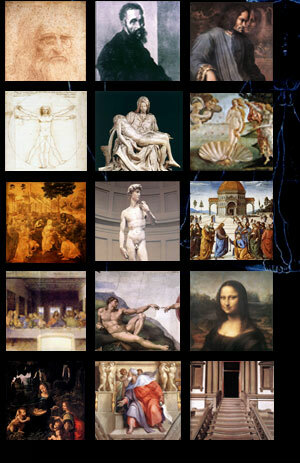 Leonardo's analytical scrutiny and Michelangelo's sweeping vision are two opposites that epitomize the new visuality. The class will analyze major works of the period to understand the development of their respective styles and their impact on the artistic scene. The course will conclude with an examination of the myth of Leonardo and Michelangelo, its reception and relevance today.